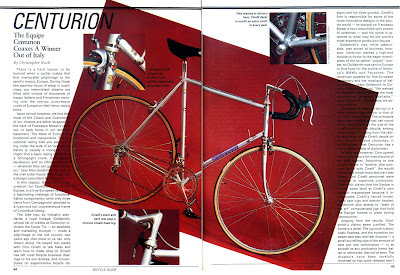 The Centurion brand, "Equipe"story started here with having received a scan of the 1985 BICYCLE GUIDE which had a feature behind the creation of this bicycle. Subsequent to that blog entry we heard from the man behind the project, Alan Goldsmith, and you can read his comments in that blog entry. MSRP: US$995 Introductory price: US$790. high-end "project bikes," which were co-branded Cinelli\Centurion. This bike was produced for one year only. ".... Alan Goldsmith, the guy who did the deal with Cinelli for Western States Imports (WSI) has written to me and filled in many details that clear up questions about this bike's origins, who built it and where. 1. The deal was done between WSI and Cinelli (the company) of Milan. (the company) in the negotiations that began in late 1983. 3. The frame was designed by Goldsmith and built in the Chiricho (note: name of framebuilder) shop on the outskirts of Milan after design details were discussed among Goldsmith, Andrea Cinelli and Chiricho and revisions were made. The Chiricho shop also built Super Corsas for Cinelli (the company). 4. Goldsmith says not more than 150, or one shipping container load, of this bike was made. He has since had a chat with another former WSI principal who said he "feels" that the number was either 50 or 100, but was not sure. 5. Goldsmith said that "sales were horrible" due to a host of logistical and market factors. It was not a failure of the bicycle but a failure of distribution and marketing. My own thinking is that the numbers must be more than 50 as I've seen 17 sell on eBay over the last seven years and am aware of half a dozen more in private hands. That would be an unusually large percentage of the total to track down. So maybe a 100 but I would go with Goldsmith's guess of 150 as one container load would seem a logical first contract target. It might also be a reasonable number for the shop to turn out in a year, in addition to whatever SCs it was producing. Just uninformed speculation here on my part. There is still a question of Cino Cinelli's role, if any, in the Equipe project. The introductory ad in the December 1984 of Bicycling Magazine clearly states: "The frame is designed by Cino Cinelli and production is coordinated and supervised by his staff." But Alan told me that as far as he knows, Cino did not play a role in the Equipe project. He pointed out that Andrea Cinelli, who was running the company at the time for Antonio Columbo, was an expert in his own right and would not have needed his father's help executing the Equipe project. I'm thinking the writer of the '85 Bicycle Guide article, which also implies a Cino role, may have confused Alan's visit with Cino to discuss the Centurion Ironman DS of '85 after Alan signed on Dave Scott as endorser/promoter of that model, not yet on the drawing boards. Alan said he had hoped to incorporate Cino's ideas into the Ironman design but WSI nixed the idea in favor of designing it after the already successful Comp TA, another project of Alan's. Alan, a lawyer by profession, and his wife Susy started up Bikecology in Santa Monica, CA, in 1971. Bikecology (renamed Supergo in 1982) was a retail and mail order business dealing in high-end European bikes, frames and components. It was sold to Performance Bicycles in 2002. Alan did two stints with WSI under contract as a consultant, the first in the late '70s working on the Semi-Pro and Pro Tour models among others and in the early to mid- '80s focusing on the Comp TA, Equipe, Ironman and Accordo models." Addendum: Alan Goldsmith wrote in with, "The metallic silver bike pictured in the article was the production model. There were 2 prototypes painted semi-matte black. The texture was close to what we would call “eggshell” in a house wall paint. Those were the bikes we showed to some dealers, test rode, etc. I don’t remember what happened to them, but they would be the rarest of the rare." The more I read about this bike, the more I like mine, but the proof is in the ride, which is exemplary. I have a Super Corsa and an Equipe, and the two share, at a minimum, a ride and crafstmanship that make them great to own. I have had this bike since buying it for triathlons in 1985. It is still the bike I ride today. I have put some pictures of it up on my blog: http://recoveryourstride.blogspot.com/2012/05/1985-centurion-cinelli-equipe.html and yes, it is an awesome bike! I was happy to see the article from Bicycle Guide as I lost my copy. Had one in 1988 but sold it cheap because I was obsessed with having an all C-Record bike. Totally regretting it now! I been haveing mine for about 5 years now I love it .